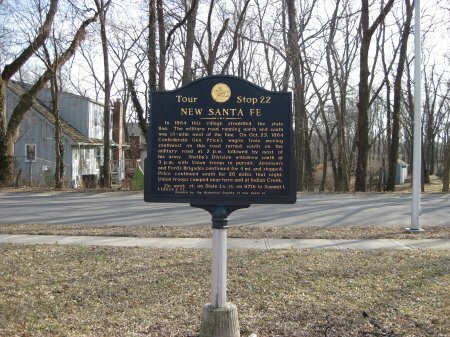 Directions to Stop #1: This marker is located on Santa Fe Road about 100 yards east of State Line Road. From the Kansas City area, take I-435 to the State Line Road exit (75B) in Kansas. Head south on State Line Road for about 2.5 miles. Turn left (east) onto West Santa Fe Trail. There is a small church parking lot up ahead on the left (north) side of the street. Pull into the church parking lot and park next to the historical marker.This tour stop is located in Kansas City, Missouri 64145. Description: In Independence on the morning of Saturday, October 22, 1864, Price sent his wagon train towards New Santa Fe (also known as Little Santa Fe). The wagon train and cattle herd was accompanied by Brigadier General William L. Cabell's Brigade and several thousand unarmed recruits. Their objective was to reach the Military Road that went from Fort Leavenworth to Fort Scott. After being defeated on Sunday October 23rd in the Battle of Westport, the rest of Price's Army also retreated through New Santa Fe. The pursuing Federals camped here in New Santa Fe on the night of October 23, 1863 while Union commanders met at the Thomas Farmhouse (about four miles north of New Santa Fe) to plan their pursuit of the retreating Confederates. "The enemy having been fairly defeated at Westport after over three days of fighting, a vigorous pursuit was necessary to prevent his taking our military posts which are located near the State line at various points between the Missouri and the Arkansas, a distance of about 300 miles." In actuality the federal pursuit would not be vigorous at all. Curtis argued for pursuit. Pleasonton argued that his division was exhausted. Dietzler and Carney argued about getting the militia home in time to vote in the upcoming 1864 elections. Finally, an agreement was reached Pleasonton and Blunt would pursue the Confederates. Curtis released the militia. The new pursuit column camped at New Santa Fe on October 23rd. The Federals needed rest after the heavy fighting of the last few days.Twelve hours after defeating the Confederates at Westport, the Federal Cavalry resumed their pursuit. Colonel Thomas Moonlight's Cavalry Brigade was detached from the main pursuit column to protect the Union right flank and prevent the Confederates from invading Kansas. Although exhausted and demoralized after their defeat at Westport, Price's army continued their retreat south during the afternoon and evening of October 23rd. Price had managed to get only a small distance in that 12 hours. His wagon train was slowing him down.